The Facebook phone: the device rumoured for so many years. It left people guessing left, right and centre. It was billed as potentially the biggest threat to the mobile market since the original iPhone, and with such an iconic brand powerhouse behind it the possibilities were almost endless. So what did we get? A nondescript Android handset with a lightweight skin. Seriously guys... what? 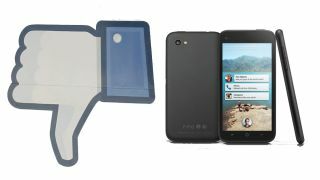 Ok, so the HTC First isn't strictly the Facebook phone we were all waiting for. Instead it's a simple handset with an extension of the social network's application which puts it front and centre. All. The. Freaking. Time. The handset itself isn't actually that bad: the simple clean design is easy on the eye with a decent 4.3-inch display, dual-core processor and Android Jelly Bean at its heart - plus there's a range of colours to entice even the most spotty-faced 13-year-old. Despite that, it's not going particularly well for the HTC First. In the US the only carrier to offer the handset, AT&T, slashed its on-contract price to $0.99 and now looks set to discontinue sales, while in the UK the First may never make it into stores. So how did this fresh foray into the mobile market go so wrong for Zuckerberg and co? Firstly Facebook plumped for a handset which falls into the muddy water of the mobile middle market - a congested cesspool of Android smartphones with a smattering of Windows Phone 8 devices thrown in for good measure. It's a place where even the big names struggle to carve out an advantage. It's essentially the no man's land of the phone industry, and if you don't have a super low price or next-gen features to set you apart from the competition, you'll find it almost impossible to stand out. You need a pretty special USP if you're going to win in this arena and the Facebook Home overlay which adorns the First is, as we said in our review, nothing more than a glorified screensaver. Now consider the price. In the States you'll have to shell out $350 (about AU$360, £230) for the HTC First SIM-free, making it more expensive than the excellent Nexus 4. Consider who may be tempted by a Facebook phone - it will be the teenagers who frequent the network, relying on it to fuel their social lives, not the 35-year-old city banker or the parent who uses it to spy on their children and reconnect with old school friends. With this in mind, the HTC First needs to be priced in the pocket money region of the market - a budget phone which puts Facebook front and centre for those who actually want that much interaction. That said, who actually wants Facebook shoved in their face every time they look at their phone? Even the most addicted teens would get fed up with Home after a while. I'm blissfully aware that Facebook Home can be turned off in a matter of seconds on the HTC First - but if you're going to switch it off what was the point in buying the phone in the first place? Facebook also kind of shot itself in the foot when it announced you'll be able to download Home on a number of top handsets including the HTC One X, Samsung Galaxy S3, Galaxy Note 2 and Galaxy S4. All exceedingly popular handsets, all of which are considerably better than the First and thus provides users with absolutely zero impetus to switch to the dedicated Facebook option. In short, the HTC First is a handset that no one was asking for and nobody needs, pitched at the completely wrong price point, spec level and audience. If you're an exception to this then perhaps it's time to pull back the curtains, put on some slacks, move away from the computer and actually go outside. It may shock you but there's a world outside of Facebook; you should try it sometime.